This season will be Coach Coats’s twentieth season as a football coach, and he is thrilled to be new head football coach! He is a native of San Leandro, California and after earning his degree in Political Science from the University of California, Davis, he began his teaching and coaching career at his alma mater, San Leandro High School. Since then, Coach Coats’s career has been highlighted by teaching and coaching jobs in Virginia and San Francisco Bay Area, where he was a long time assistant head coach and coordinator at James Logan High School. 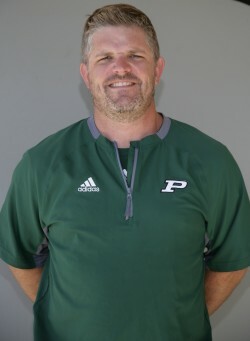 Coach Coats became a head football coach at Piedmont High School in 2013, compiling at 18-7 record over two seasons, culminating in a 12-1 season in 2015. Scott is married to Poway High School alum Kristi, and has two boys, Drew 8, and Charlie 5. Coach Coats moved to the San Diego area two years ago to be closer to his extended family, and was Poway High School’s quarterback coach last year.